Hello from Cambodia, my first stop in Indochine, the former French colonial empire in Southeast Asia that became Cambodia, Laos and Vietnam in the aftermath of Ho Chi Minh's defeat of the French at Dien Bien Phu (http://en.wikipedia.org/wiki/French_Indochina). In 1992 the name Indochine entered the US mainstream with the release of the Oscar winning movie of the same name starring Catherine Deneuve (http://www.youtube.com/watch?v=8xJQPuY3G7k). I am enchanted by the culture and history of the area but am certainly glad (I'm sure Gertrud concurs) that my experiences haven't been quite as adventurous as Ms. Deneuve's tango scene. (http://www.youtube.com/watch?v=97Esl2LedIg)! I am very excited to have finally reached Cambodia after several attempts. Although my work has been in the capital of Phnom Penh (http://en.wikipedia.org/wiki/Phnom_Penh), a long-time personal goal has been to visit the 12th century temple complex of Angkor Wat (http://en.wikipedia.org/wiki/Angkor_Wat), which many consider to be one of the "seven wonders of the world." I almost made it in 2008 but my flights were cancelled due to Thai political demonstrations that closed the Bangkok Airport. In the fall of 2009, I was scheduled to fly to Cambodia from Australia but had to return home for an emergency medical procedure. So I am very elated to have finally visited Angkor Wat which I did this past weekend. 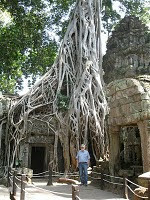 My biggest surprise was to discover that Angkor Wat is only the best known of a large number of temple complexes that Khmer rulers built around Siam Reap between the 9th and 12th Centuries -- BE SURE TO CLICK ON THE NEXT LINK - (http://www.canbypublications.com/siemreap/srtemples.htm). Researchers have recently concluded that this area was likely the center of Asia's largest population at the time. I spent several hours in the heat on Saturday climbing up and down the ruins of Angkor Wat and other temples, stopping frequently to view and photograph the impressive architecture and bas relief sculptures which are in various states of disrepair and restoration. My favorite complex was actually Ta Prohm which is much smaller: what makes it especially appealing are the huge gum trees with incredible root structures that have taken over the temples, pushing right up through the monuments and walls. The following link contains some of Ta Prohm's remarkable scenery (http://www.canbypublications.com/siemreap/temples/temp-taprohm.htm). I can't close without at least mentioning the genocide against the Cambodian people, carried out by the Khmer Rouge under Pol Pot, and responsible for the deaths of nearly one-fourth of the country's population -- approximately 1.5 million people. (http://en.wikipedia.org/wiki/Khmer_Rouge). Identifying all of those guilty and punishing them still dominates much of today's Cambodian news, not unlike the aftermaths of the Jewish Holocaust or the Armenian Genocide. A further legacy of the Khmer Rouge are the millions of land mines spread throughout the country (http://www.cambodialandminemuseum.org/menu.html) which will continue to be a threat to Cambodians for many decades to come. This afternoon I'm off to Hanoi for a week's work after a short stop in Vientiane, the capital of Laos. I'll be home just in time for Thanksgiving.